Can you believe we're already more than one month into the new year? Admittedly, January has been a bit of a blur for me, what with work issues and our ongoing work at my parents' house. For the better part of two months, we have been spending a huge chuck of our Sundays at the parental home, where we have been sorting, clearing and finally cleaning, in order to get the house ready to be put on the market. As on these days we only had a couple of hours to ourselves, I didn't bother getting dressed. At least not properly, that is. Floral drawstring trousers and a jumper may not sound too shabby, but it isn't the kind of outfit you'd usually find me wearing, and certainly not one I'll be sharing on the blog anytime soon. Two Sundays ago however, before changing into my work wear (jeans and an old polo neck, if you're interested), I made the effort of putting on the dress I'd found at Think Twice during the week. 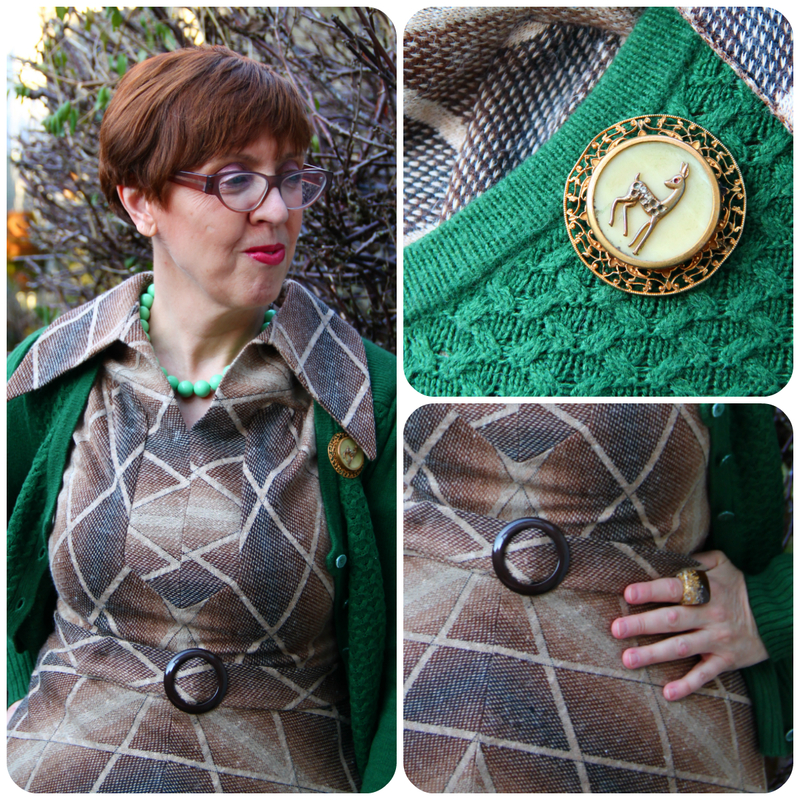 It's a vintage shift dress with a high, stand-up collar, one part of which I've only just noticed wasn't standing up that day. But do you think my photographer told me? 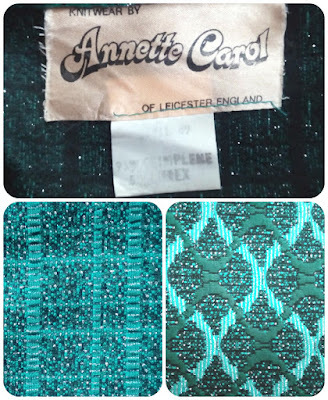 I was drawn by its gorgeous teal colour and the lurex shimmering through the fabric. The contents label, although quite faded, proclaims that it's 95% Crimplene and 5% Lurex! Apparently, it was designed by Annette Carol of Leicester, England. Obviously, I tried googling the brand name, but no luck. I wore it with my new Tiger's Eye pendant, a charity shopped wide tan belt, and a pair of tan boots. Speaking of which, aren't they fabulous? They are by Miz Mooz, a sales bargain from many years ago. Unfortunately, I can't wear them for any length of time as they are rather bad for my back. Hence, they're still in perfect condition after all these years. When we were clearing the house's attic, we came across a small cabinet we quite liked the look of. After taking its measurements to make sure it would fit, we brought it home and, following a good clean and polish, it is now taking pride of place in our hallway. I'd never seen the cabinet before, and neither had my siblings, but chances are that it used to belong to either pair of grandparents. It deceptively looks as if it has four drawers, but the ones on the right are actually a pull down door. Inside, there's plenty of space for handbags, scarves and berets and there's space underneath for a few pairs of boots so that they no longer clutter up the hallway. 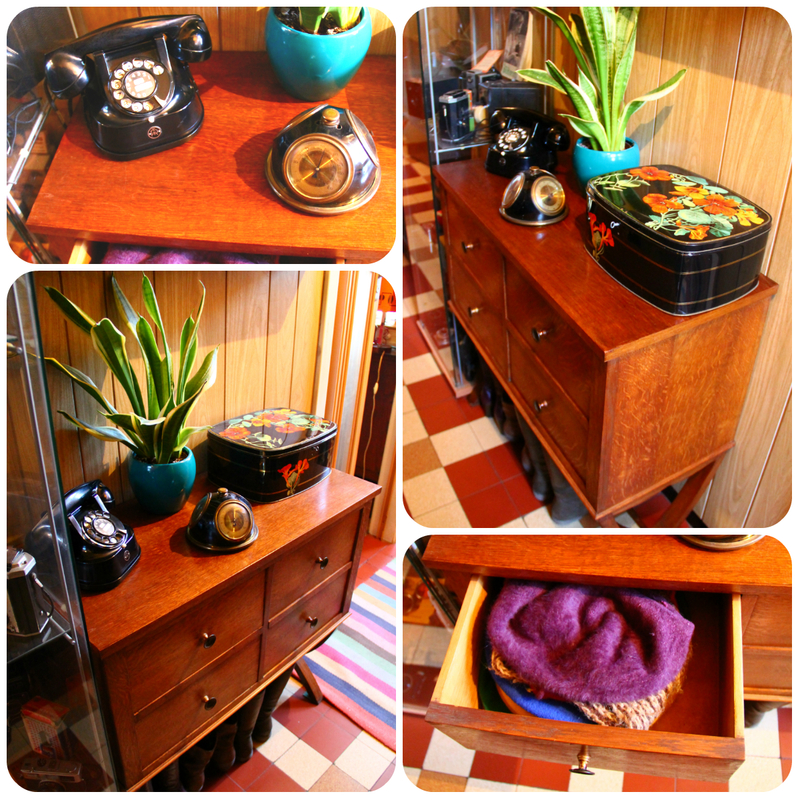 On top, there's a classic Bakelite telephone, which we've had for many years. It seems to look quite at home here! 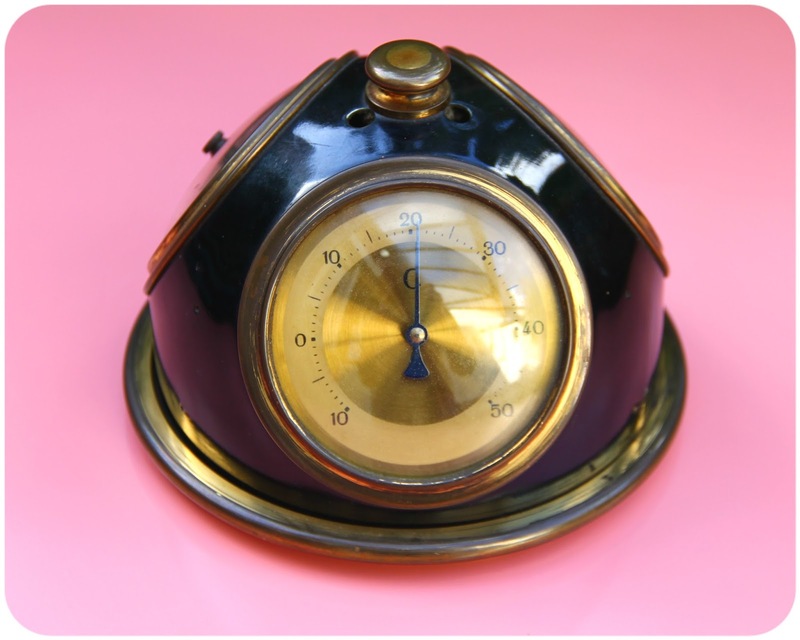 The round object in the middle is a revolving barometer, thermometer and a hygrometer, which Jos picked up at a charity shop event in October 2017 (see here for a close-up), while the large black tin with the Nasturtiums, a charity shop find from last Summer, currently holds my collection of gloves. Here's a look at our hallway taken from the front door. 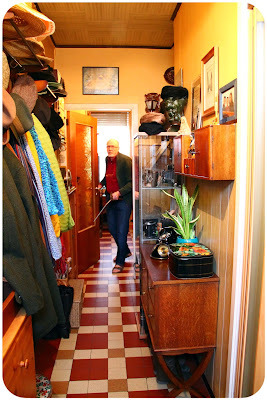 You can just make out the edge of our IKEA shoe cabinet on the left, with our vintage coats rack with its jumble of coats, hats and caps beyond. On the right, above the cabinet, is a small, charity shopped, hanging cupboard, which holds shoe cleaning paraphernalia, amongst other things. Beyond the cabinet is an IKEA display unit showcasing our collection of vintage cameras. The floor tiles are original and as you can see they continue into the room beyond, which is our dining room. I took the afternoon off on Monday, as I needed to mentally prepare myself for some upheaval at work in the following days. It was a cold but bright day and we took advantage of the available daylight to show you what I was wearing that day. Brown and beige might not be colours you associate with me, but the dress's eye-catching print more than makes up for this. 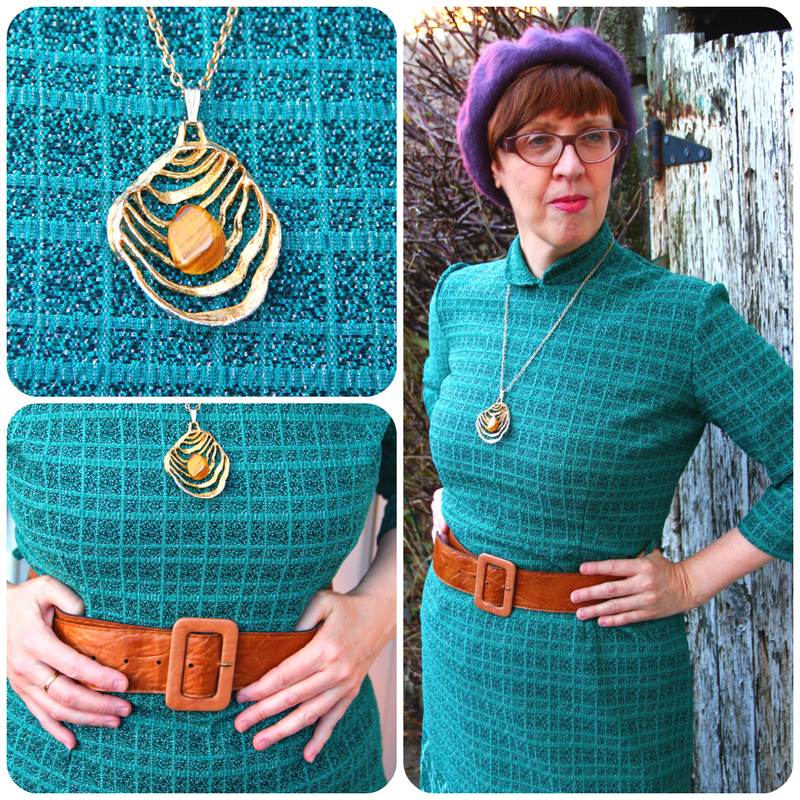 And for once, I am wearing the dress's original belt, as I love its round buckle. This is another Crimplene dress, although in this case the polyester is joined by 20% wool, which makes it ideal for colder days. On top, I wore a bottle green charity shopped cardigan, to which I pinned a vintage Bambi brooch, its circular shape echoing my belt buckle. 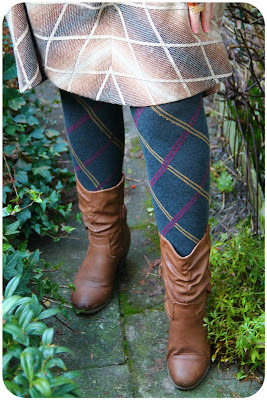 I continued the plaid theme of the dress by wearing warm woollen tights in green, with a plaid pattern in red and yellow. It was back to work on Tuesday, and oh my goodness, what a stressful week it turned out to be. I am office manager at a small trading company, with a head office in Miami, and we had a visit from the boss, who told us he would be retiring by the end of February. To cut a long story short, as from the 1st of March, I will have two new bosses, instead of just the one. They joined us on Wednesday and I'm sure you can imagine my relief when they turned out to be the nicest guys ever. On Thursday, we had lunch together and returning to the office, I simply had to show them this gem of a church, which is located in what looks like a tranquil Italianate piazza. 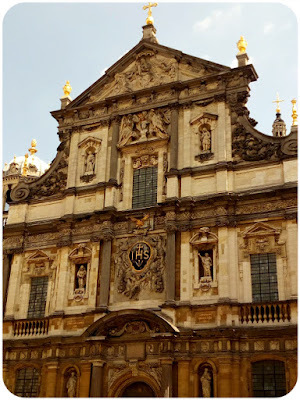 This is the Sint-Carolus Borromeus church, which was commissioned and built by the Jesuit order between 1614 and 1621, and which counts as an archetype of Baroque architecture. 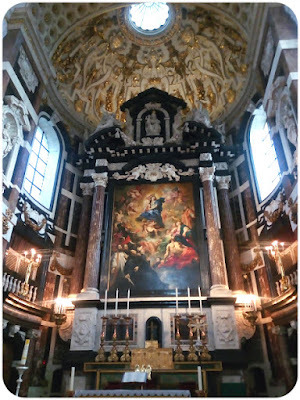 It is the Baroque church of the Low Countries and the church of Rubens, even though in 1718 a fire destroyed the 39 ceiling paintings by his hand. 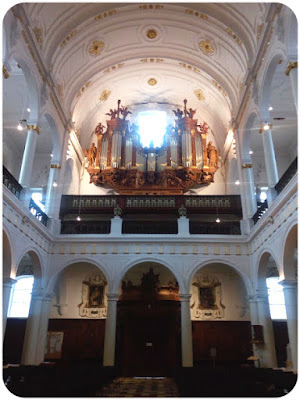 As luck would have it, the church's doors stood invitingly open, allowing us to admire its stunning interior. 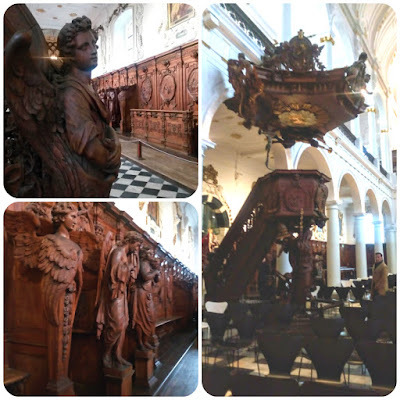 Our visit was enhanced by the mighty organ being played, which made the experience even more awe inspiring. Now I'm joining Beate, Natalia and Tina at this month's Modish Matrons, and I will be linking to Patti's Visible Monday at Not Dead Yet Style once the link is up. And finally, I am linking up to Mica's Weekday Wear Linkup! What a beautiful church! There's nothing like church organ music to send shivers down one's spine! 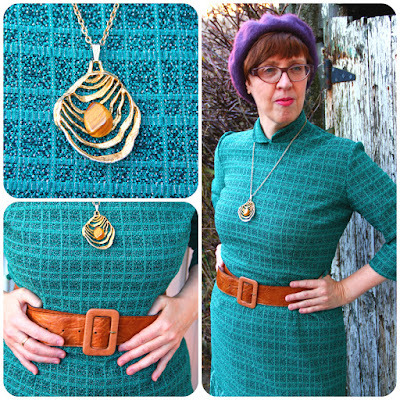 I loved your teal dress and the pendant looks brilliant with it. 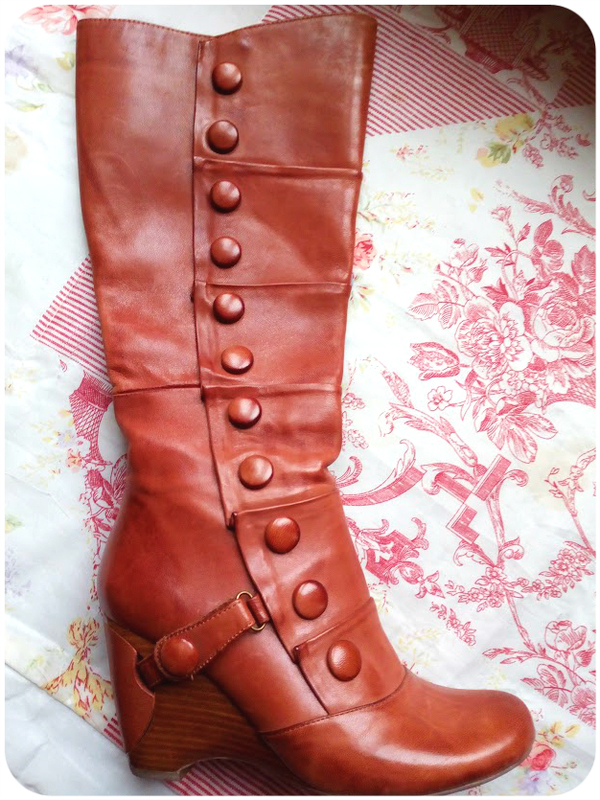 The boots are gorgeous - what a shame they hurt your back. The beige and brown dress with the fantastic pattern looks lovely and I love it paired with green. What a well organised hall you have. The 'new' cabinet is lovely. So glad the new bosses are nice - whew! Time fly so fast. You look pretty in the picture. Phew, i am glad you like the new bosses!!!! Scary times though- it's like that with a new head teacher, esp as a music teacher! Your first dress is beautiful!!! My absolute favourite colour!!! By the way, I wondered if you wanted some red, orange and yellow tights at all and possibly some purple patterned ones too! I have worn them only once or twice but I really don't get on with coloured tights anymore- I prefer to wear leggings and I really don't know what to do with them! I know it seems a strange thing to ask, but I thought I'd ask!! LOVE those Miz Mooz. Shame they bother your back but I can see by the size of the heel I'd have the same issue. The pitch is too high. I adore teal and orange. All those rich jewel tones look so great together. It really reminds of Joan from Mad Men. That cabinet is perfect for your hallway! What a great piece. Even better knowing that it has been in your family for so long. I hope work can return to less stressful environment now. It's such good news that you like your new bosses, change of that variety can be very unsettling. 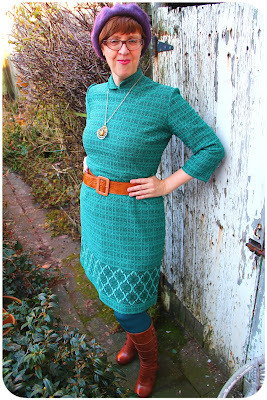 I love the green dress, especially the little collar. 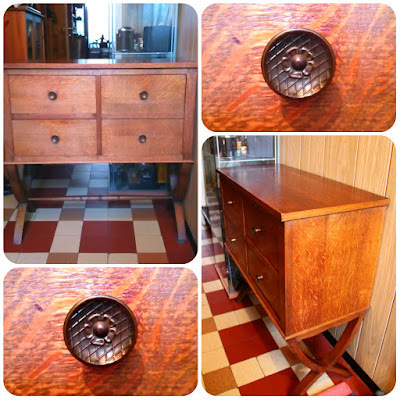 And what a perfect find for your hallway, it was waiting for you to find it all these years, I'm certain of it! What a relief things worked out OK at work. I hope everything is smooth sailing from now on. I am in love with your hallway, and the tiles are incredible. that church is really stunning! inside and out! good that you showed it to your new bosses! i´m glad they are nice guys. That cabinet you got has me entranced - it is a very pretty cabinet, but those handles, I know those handles! I am wondering how I know them, it must have been something my grandparents owned, as I know my parents don't have anything like it in their house. I might have to show the photo to my mum, see if she remembers! Love anything with lurex in it. That teal dress is fabulous. And the belt and boots are a perfect complement. That cabinet has some great legs! The church is magnificent. Best of luck with the new boss! It sounds like you've had an exhausting time of late, probably exacerbated by the time of year. I find January and February can make me fairly glum. It's good that your new bosses have turned out to be so nice. The church you took them to is stunning and with the music to enhance it, I can imagine that it was indeed spine tingling. I love the cabinet and it looks great in your hall. 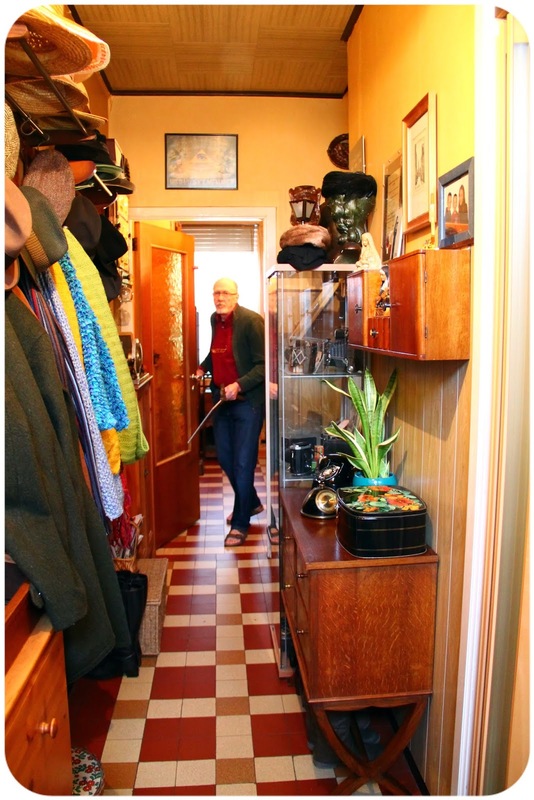 That does not sound like fun: work upheaval and cleaning out of the parents' home. I'm glad you were able to salvage that glorious cabinet! I love getting a look at your hallway - that flooring is lovely. I adore that teal dress! What a fabulous cut and colour for you! Happy weekend! 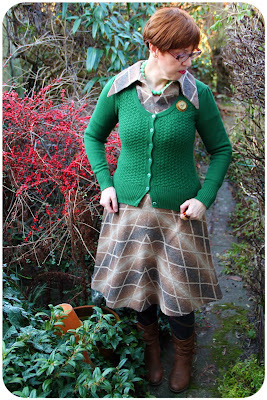 That teal dress is fab, especially with that deep border weave - and if anyone can make brown into a rainbow, it's you! I too have weekend outfits I don't blog about. I fall into the habit of wearing things I wouldn't wear in public at weekends. If I didn't have an office job I'd be a solid-gold slob! I bet your trousers and sweater look much nicer. This teal dress is stunning, love its color and pattern (lurex! ), and love it with the tan boots and belt!, so delightful colors! Sorry that you have had a stressful week at work and also had to clear and clean the parental house on Sundays, it sounds like lots of work!. Glad to see that the cabinet looks really perfect in its new place! That teal dress is quite beautiful on you. It is interesting how quickly this month went by. I think it is perfectly fine and wonderful to walk around in floral trousers and a pretty sweater. But yes I always picture you in a dress. And while I generally see you in color, I do appreciate this beige and brown dress on you. It’s very rich and classic. The platform boots. Yes I can see how much fun they would be to wear. Unfortunately I can also feel how painful they might be to wear!